It’s not uncommon to hear veterans of older conflicts like World War II say that they were too young to officially join the military, so they lied about their age in order to enlist. These days we have more advanced recordkeeping and stricter enforcement, so it’s probably tougher to pull that off. Even if your toddler manages to keep a straight face and stick to his story, we doubt he’s going to be able to talk his way into the armed services. That’s probably for the best, all things considered, although a toddler-based army would have a few points in its favor. Sheer adorability is maybe the biggest factor. Striking fear into the hearts of your enemies is all well and good, but imagine the reaction of any opposing force who saw a squadron of camo-clad babies toddling toward their bunker. We imagine the only thing they could do in that situation would be to lay down their arms and start babbling baby talk at the invading forces. And even if that didn’t happen, the toddler army would have a few tricks up its sleeve. Anyone who’s ever spent much time with a cranky two-year-old can attest to their devastating force. 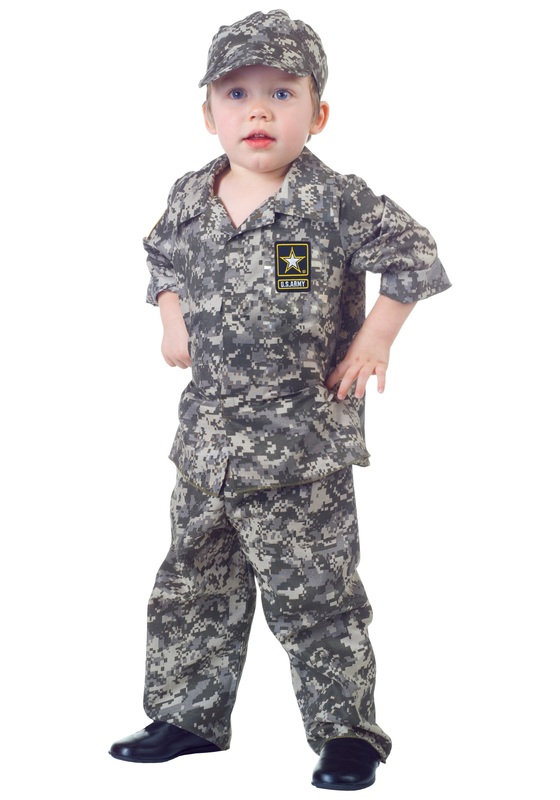 Combat ready or not, your little one will at least look the part in this officially licensed polyester U.S. Army uniform, featuring a shirt with Velcro fasteners, elastic-waist pants and a matching hat. The camouflage print and official U.S. Army patch on the chest lets everyone know this kid is the real deal, even if the actual chance to serve is still a few years away.